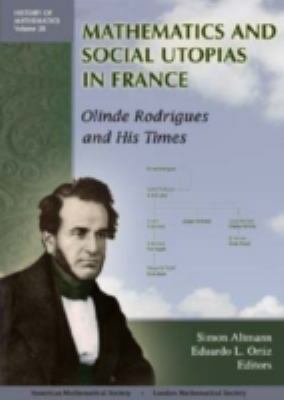 by Altmann, Simon L., Ortiz, Eduardo L.
Altmann, Simon L., Ortiz, Eduardo L.
Social reformer, banker, and mathematician, Olinde Rodrigues is a fascinating figure in nineteenth-century Paris. Information about him is obscure--scattered in publications on history, mathematics, and the social sciences--and often inaccurate. Rodrigues left no papers or archives. Here, for the first time, is an authoritative account of his family history, education, and important mathematical works. Written by a team of prominent mathematicians and historians, the book comprisesthe interests and associations that make Rodrigues such a remarkable character in the history of mathematics. This is a superb panorama of nineteenth-century France, portrayed through the life and work of Olinde Rodrigues. The beginning chapters attempt to recreate the scientific and socialbackground of nineteenth-century Paris and Rodrigues's place in it. The following chapters discuss his contributions to a variety of mathematical fields (e.g., orthogonal polynomials, combinatorics, and rotations). The final chapters discuss contemporary reactions to his mathematical work. Sufficient background is given to make it accessible to readers familiar with basic college mathematics. The book is suitable for specialists in the history of mathematics and/or science, graduate students,and mathematicians.Altmann, Simon L. is the author of 'Mathematics and Social Utopias in France: Olinde Rodrigues and His Times', published 2005 under ISBN 9780821838600 and ISBN 0821838601. Loading marketplace prices 2 copies from $10.11 How does the rental process work?